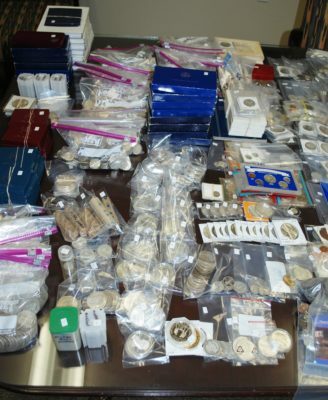 Coins, Coins, Coins and More Coins!!!! All selling ABSOLUTE without minimums or reserves!! 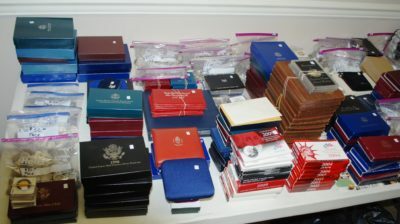 We have lots and lots of bags of bulk silver!!! Mercury Dimes, Roosevelt Dimes, 1964 Kennedy Halves, Franklin Halves, Walking Liberty Halves, Washington Quarters (with a few standing liberty’s and barbers thrown in for good measure) and Kennedy 40% Silver Halves!!!! 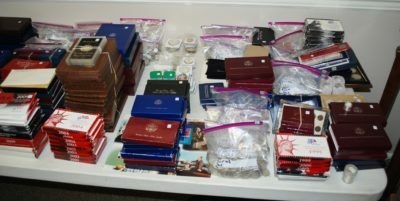 Quarters are in bags of 200 coins, Dimes are in bags of 500 coins, Halves are in bags of 100 coins and there are a few toward the end with smaller amounts!!! We also have a “Year of the Snake” 1 kg silver round!!! 1 kg is equal to just over 35 ounces!! We have a 5 ounce silver round and lots of 1 oz. coins, medals and rounds!!! What’s that? You like Gold better? We have Several gold coins individually and in coin sets!!! Some are American but most are foreign. They are still gold, just foreign gold. We have lots of foreign silver coins also. A lot of the foreign coins range from 50% silver all the way up to Sterling at .925. 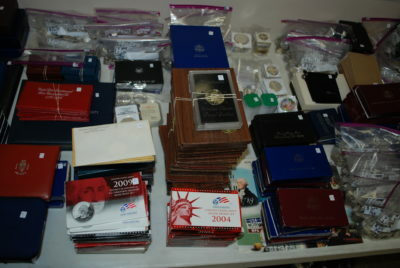 Lots and Lots of boxed Coins and sets: Korean War, Jamestown 400th Anniversary, USO Commemorative, Liberty Coins, U.S. Constitution, U.S. Capitol, Congress, Los Angeles Olympics, Prestige Sets, Premier Sets, Silver Proof Sets, 4 – 20th Century Type Sets (2 in books and 2 framed), Bicentennial Silver Sets, Dolley Madison, Thomas Jefferson Anniversary and Lots, Lots More!!!! This auction has over 600 Lots selling at On Line Only Auction!!! This is one of the best we have had in years!!! If you miss this one, you will be kicking yourself for months to come!!! Lots start ending at 2:00pm EDT on Sunday, October 28. – soft close – Any lots may remain open for extended bidding as long as bidding activity continues on that lot. Other lots will continue to close as others are extended. Once all bidding activity has ceased, the clock on that lot will run out and the lot will sell. Once the lot reads “closing” no more bids can be placed on that item. If there is 1 second left on the clock and someone bids, it will extend that lot by 2 minutes. No Sniping!! TN residents, state sales tax will be charged on this auction!! Pick up/Removal: Monday, October 29 from 8:30am – 5:00pm EDT – If you would like to pay by cash or check, you must do so before 12pm noon. After noon, all outstanding invoices will be charged to the credit card on file. If you live out of the area or out of state, your credit card will be charged automatically and your items will be packaged and shipped. You need do nothing more.